Responsible conduct of research stems from more than one individual’s behavior - it is a learned and shared culture of promoting integrity. One of the first places new scientists are exposed to this culture is in graduate school, where they start to learn the practices and norms of their chosen field. Those who train students and post-docs have a significant influence on trainees’ perceptions of good research practices. Take the time to cultivate a relationship with your trainees. They are there to learn from you, so discuss progress and problems in an open and constructive manner. This can encourage conversation, promote transparency, and make them more comfortable coming to you with questions or concerns. You are responsible for any data put forth by your research group. Regularly reviewing raw data, especially results related to any paper, grant, or poster; this can help catch both honest errors and intentional manipulations before they get out your door. Be clear about individual roles and responsibilities regarding experiments, data management, authorship, and timelines of projects, as well as how trainees will be evaluated. Consider adopting a formal onboarding process and posting written standards in the lab. Not all trainees will arrive with the same skill level. Avoid making assumptions about anyone’s prior knowledge by regularly reviewing protocols, proper use of equipment, and data storage and management. Be prepared in case you ever suspect research misconduct. Find out now who the RIO is at your institution and share their contact information with your research team. The advice seems to be a reminder of things that should be obvious (agree with Ken P), but it's always good to have a reminder in advance (preminder?) 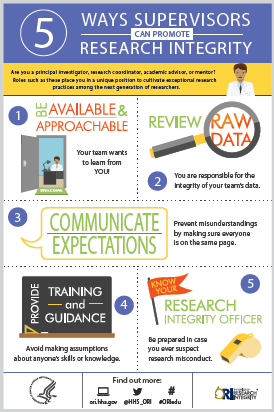 for those investigators that are just beginning to supervise research staff. I am always happy to see visuals of a topic that can be difficult to picture. This is a great resource, thanks for developing it and making it available as a PDF. The last point about getting to know your RIO is a great one, and also leads to a suggestion: if you could provide a version of this with a space for institutions to include RIO contact information, that would be even more helpful. Your new infographic gets to the point and gives good advice. The sad part is that the advice is so obvious that anyone needs to be reminder - or taught - of these points. Very helpful tips, simple and to the point! I would like to translate it into Spanish keeping the same format. Would you be willing to share your template? Of course, I will send the Spanish copy right back to you for sharing.